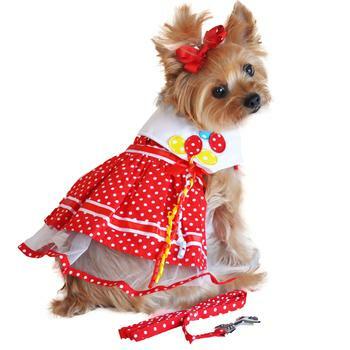 This adorable dress would be darling for your dog to wear on her own birthday or for any other celebratory occasion. Balloon accent on the lapel with curled ribbon. Heavy Duty touch fastener Closures at neck and chest. Extra strength nylon reinforced D-Ring allows the dress to be used as a harness. Dress includes a matching leash! This dress is very easy to put on with heavy duty touch fastener closures at the neck and chest. The nylon reinforced D-Ring allows the dress to be used as a harness which will help keep your party girl in check. 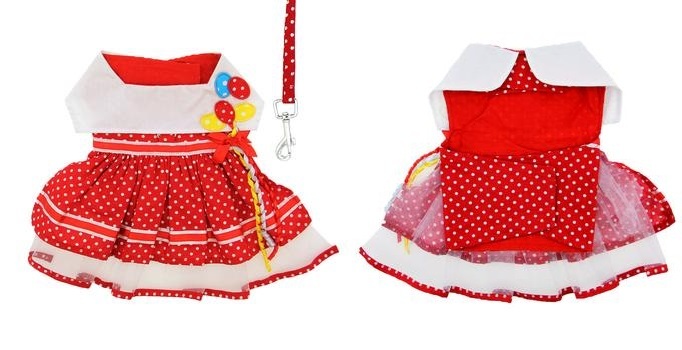 This dress also includes a matching leash for a perfectly "paw"lished look! Imagine your darling pet in this summer dress!